PC to Mobile Mac Bulk SMS Software for android phone empowers you to send group text messages simultaneously from PC using android mobile. 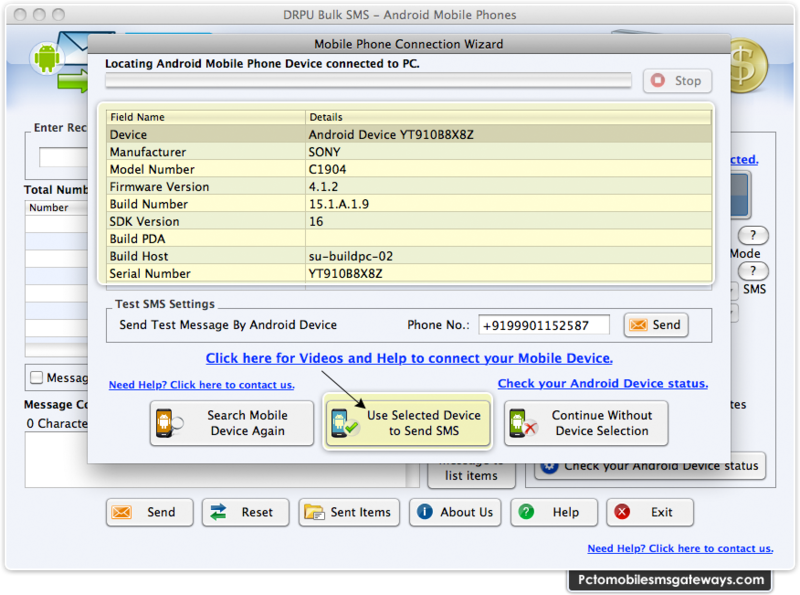 Android mobile messaging program for Mac OS X can broadcast single text SMS to individual or list of contact numbers. Mac Bulk SMS Software provides option to load contacts files from Mac computer for sending unlimited text messages across the world. PC to mobile SMS messaging application saves sent text messages detail to templates for future references. Provides exclusion list Wizard option : Text message software for Mac OS X offers exclusion list wizard option to maintain list of contacts or group. Saves text messages details : Mac bulk SMS software for android mobile saves sent text messages with their sending date and time detail. No internet connection is requires to send bulk SMS : Mobile SMS marketing programs can delivers greetings, shares market updates, product launching details, alerts, events and other personal SMS without requiring internet connection. Skip duplicate contact number entries : PC to Mobile Bulk SMS Software for android mobile provides facility to skip duplicate contact number entries while sending bulk text messages from apple Macintosh OS X installed machine.